HWA poses a threat to hemlock trees and the overall health of the forest ecosystem here in New York, but slowing the spread is possible. One crucial element of slowing HWA’s spread is the early detection of emerging infestations. We encourage everyone to report the presence of any HWA infestations that they find and suggest reporting any HWA infestations in one of three ways, which you can learn about on our Report HWA Finding page. We encourage the use of the iMapInvasives app for reporting HWA sightings in New York. 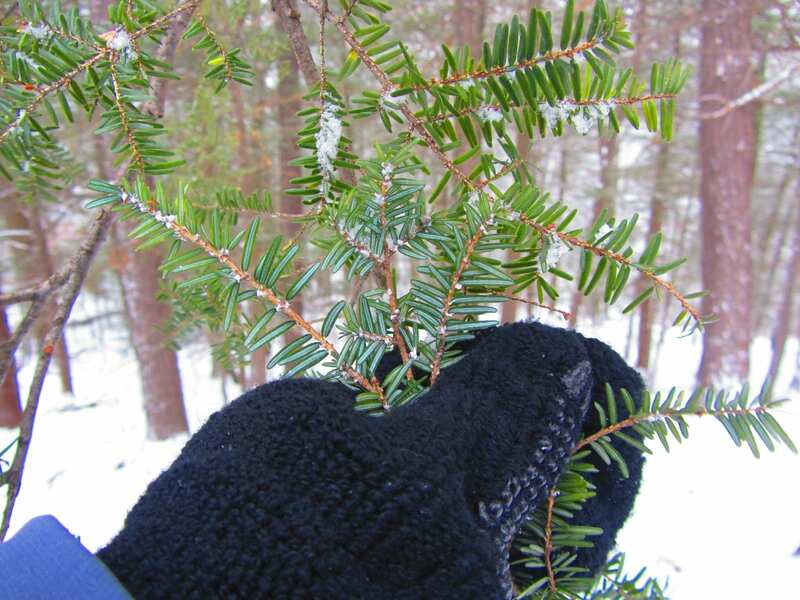 In addition to reporting findings, community scientists can help us collect field data by completing surveys of hemlocks stands. We collect data from community scientists around the state on HWA presence and absence throughout our forests, as well as overall tree health. This data increases our understanding of HWA in New York, helps us identify potential sites for biocontrol release, and improves management efforts throughout the state. You can use our HWA Survey Protocol for surveying tips. Those interested in more focused HWA surveying can help us by surveying and recording field data to improve our HWA and biocontrol research programs. This community science opportunity involves choosing specific HWA stands to survey and providing information about HWA presence or absence, tree health, site characteristics, and severity of present infestations in that stand. Surveyors should still enter their HWA presence/absence data into iMapInvasives if they have an iMap account. Our survey form will ask for the stand data that our field technicians would collect when on a site visit. In addition to letting us know whether or not HWA is present, the form also asks to describe characteristics of the stand itself to give us a more complete picture of forest health in the surveyed area. The data provided in our community science HWA surveys helps us find new infestations, alert partners and local land managers to infestations in their region, and identify potential sites for biocontrol release. It is a great way to help support our program, and steward your local forests. To survey, go to a place with good hemlock resources. This can be your favorite hiking spot, or just a stand on your own property. Surveys are conducted by checking trees for HWA by examining low branches or branches on the ground that have fallen from a stand’s canopy. It is best to check multiple low branches on each tree and branches that are all around the tree, rather than just facing in one direction. Following your survey, you’ll complete and submit our HWA Hunters Survey Form. This includes the location of the trail or property where you are surveying, the stand’s location, the date that you surveyed, and information about the weather conditions during your survey. This includes the approximate number of trees examined as you surveyed, and the amount of time that you spent surveying. We keep track of volunteer hours as part of our program grant requirements. Your data helps us maintain the funding that supports our biocontrol research! This includes the approximate size of the stand, terrain and wetness of the site, the forest composition at the stand, the approximate age class of the trees being surveyed, and if you detected any other forest pests in the area. This section of the survey will include the positive or negative HWA detection and—if HWA is present—will ask for information about the average density of HWA in the stand, and the health of the hemlock canopy. If you think you’re ready to help us collect community science data to aid in our research efforts, check out the HWA Survey Form to start reporting survey data.